The mini-figures in Pixel Junkie‘s picture look like they’re about to feature in a classic comedy song, and that’s never going to end well. Still, their Ford Model T pick-up truck looks rather lovely and at least we’ve managed not to mistakenly reference the other Right Said Fred. We are never ever going to read the cancer on literature that is 50 Shades of Grey. However, we do quite like grey LEGO bricks, and over the years LEGO have probably released 50 shades of the stuff. This can make it tempting to use multiple shades in creations, however, unless you’re building a castle wall it can look a bit messy. Not so here, where previous bloggee Jonathan Elliott has kept it simple with just a single shade, and his ’29 Ford Pick-Up hot rod looks wonderfully clean as a result. Photographed beautifully in his Red Room of Pain, Jon’s build features opening doors, a dropping tailgate, and a fully detailed engine and interior, and there’s more to see at his photostream via the link above. This beautiful vintage tram and truck pairing was discovered by one of our Elves on Flickr. Both models are the work of Dario Minisini and they’re part of a much larger and brilliantly built town scene. There’s more to see of both creations and the extensive diorama in which they feature at the link above. Taking inspiration from nature’s gypsy, Flickr’s LimitlessBricks can take his home wherever he goes. Probably quite slowly. There’s more to see of his marvellous creation at the link above. We often post old-timey vehicles here at TLCB, but it’s a rare treat when we can post old-timey vehicles that have been built in an old-timey way! 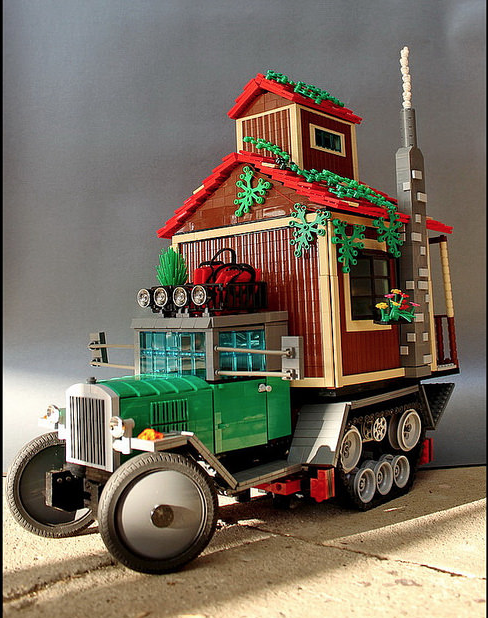 These charming 6-wide Town vehicles were discovered by… er, The Brothers Brick*, and are the work of Flickr’s grubaluk. There are lots more photos of the individual models available to view on Flickr – simply click the link above to make the jump. *Our Elves have been sternly reprimanded, the lazy turds. Looking a bit like Postman Pat’s ride from a post apocalyptic future and named after a small-ish lizard we’re not really sure what to make of Horcik Designs‘ ‘Salamander’. However our workforce of annoying little Elves love it. There’s more to see of Horcik’s remotely controlled hot rod van at the link above. This creation is a little unusual for us, seeing as it’s not really a car. But it does contain several vehicles, and they’re properly good too, so it’s earned its place here. Dario Minisini’s 1920s port scene was suggested to us by a reader, and it includes everything you could hope for in a snapshot of vintage America, including a gangster-operated distillery. There’s lots more to see at Dario’s Flickr page – click here to make the trip. Like magpies, the Elves are attracted to pretty, shiny things. This lovely little truck by South Korean builder bigcrown85 was an instant success with them. It features a neatly detailed body, with some novel parts usage such as the steps and the hammers to which the mirrors are attached. Fortunately the hammers are minifig scale. This allowed only slight damage to be inflicted in the ensuing Elf-fight over the green Smartie that the finder was rewarded with. The truck’s wheels are very delicate and we suspect the application of a bit of “Kragle” to achieve this. However, we’re not too purist at TLCB* and so we’re happy to feature this neat build. Click this link to Flickr to see details of the chassis and the alternative van version. 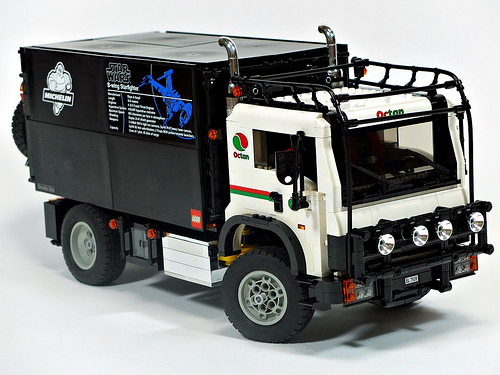 We’ve previously featured bigcrown85’s superb Dakar Support Truck, when the Elves found it on MOCpages. You can now revisit it on Flickr and view its amazing detail in high resolution by clicking this link to bigcrown85’s Photostream. *We can’t be, we work with the Elves. 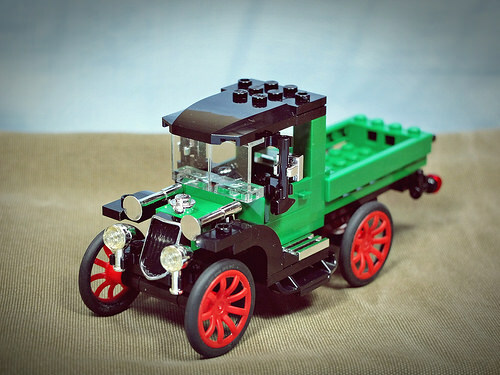 It’s 40 years since LEGO introduced people into their products, with what is now affectionately known as the ‘Maxi-Fig’. Long since replaced by the ‘Mini-Fig’ (which are now so numerous if they were to rise up against humanity we’d be in big trouble), the ‘Maxi-Fig’ was a sort of immovable Technic figure, permanently happy and with two elbows on each arm. Brickbaron pays homage to 1970s LEGO with his lovely B-Type bus populated with smiling ‘Maxi-Fig’ patrons. Brought to our attention by The Brothers Brick, you can see more of Brickbaron’s commemorative creation here.